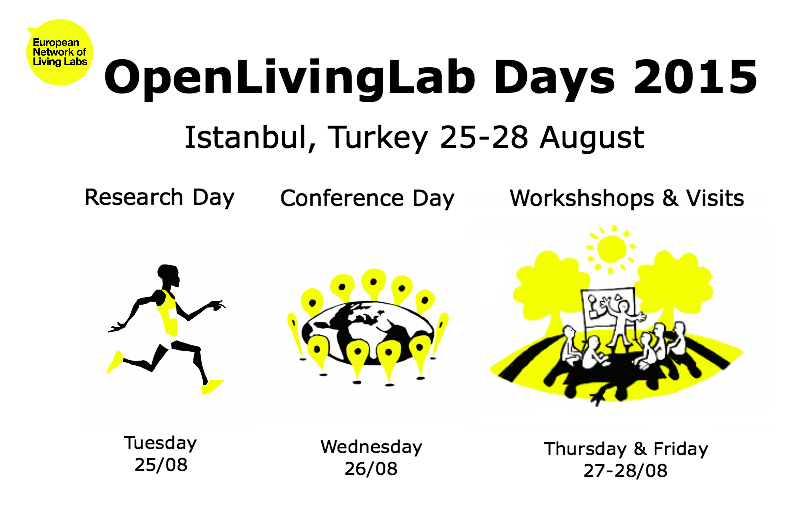 Welcome to the website of OpenLivingLab Days 2015 hosted in Istanbul from the 25th to the 28th of August. The agenda is currently in production and there is still chance for you to submit a workshop proposal or conference paper. Don’t forget to register in time to guarantee you place at the biggest Living Lab gig of the year! OpenLivingLab Days is the annual summit of the worldwide Living Lab community combing 4 days networking, sharing, learning and exploitation of theory, methods and tools. Conference elements include a research day, furthering knowledge in this field, workshops and seminars, conference day and facilitated networking opportunities. This video was filmed at OpenLivingLab Days 2014, organised in Amsterdam from the 2nd to the 5th of September by the ENoLL together with Waag Society, Amsterdam Economic Board and the Amsterdam City Council. Hosted at the beautiful De Nieuwe Liefde in central Amsterdam, the conference featured an exciting progamme including a research day, interactive workshops & seminars, visits to local Dutch labs & innovation spaces, supported and facilitated networking & matchmaking activities and the worldwide summit of our Living Lab community. Attracting over 200 participants from around the world OpenLL14 was a great event and we look forward to organising the 2015 edition with Başakşehir Living Lab in Instanbul turkey. Save the dates: 25th – 28th of August 2015! OpenLivingLab Days 2015: What to Expect? 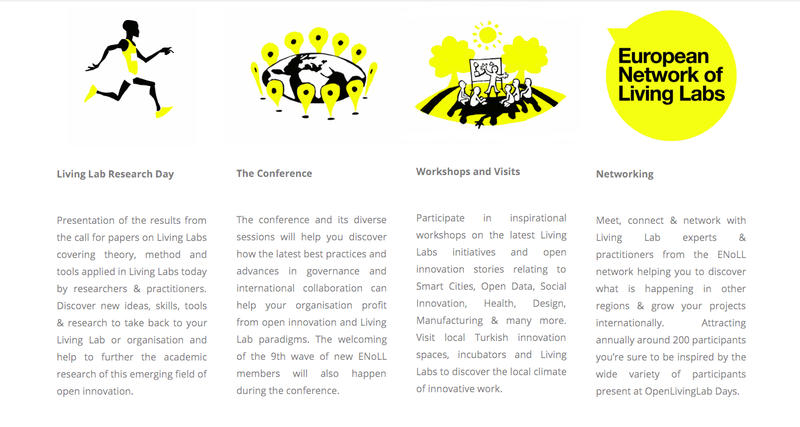 The European Network of Living Labs (ENoLL) is the international, non-profit, independent association of benchmarked Living Labs in Europe and beyond grown through ‘Waves’ of calls for membership applications. To this date, 9 Waves have been launched, resulting in 370 accepted Living Labs. Empower everyone to innovate, ENoLL brings together players in diverse fields from the creative industries, manufacturing, health, smart cities, open data and beyond. The hosts of ‪OpenLivingLab Days 2015‬ are Başakşehir Living Lab & Başakşehir Municipality: Başakşehir is one of 39 second-level districts of Istanbul, founded in 2008. Başakşehir Municipality is the local government of Başakşehir District, established after the local government elections in 2009. The municipalities has made a large investment in IT launching initiatives like a Smart Garbage Collection System helping to build a smart future for the citizens of Başakşehir. Başakşehir Living Lab is Turkey’s first Living Lab on information and communication technologies. The objectives of Başakşehir Living Lab are to be one of the leading cities/municipalities in the world in which new developed and IT-related products and services from all over the world are experimented in addition to making the people of Başakşehir inspiring examples for the other cities around the world, in terms of technology usage and creativity. Special mention must also go to the events Gold Sponsors: Istanbul Municipality & Bahçeşehir University and the Sponsors: Turkish Exporters Assembly (TIM), StartersHub, Startupbootcamp Istanbul, İstanbul Design Factory, Fongogo and TTNet. OpenLivingLab Days 2015: Why attend? Learn More Why should you attend OpenLivingLab Days 2015? What can you expect to learn, achieve, experience and importantly who can you expect to meet? Warm words and recommendations from the ENoLL President, Jarmo Eskelinen.